Considerable improvements were carried out on Portsmouth's town defences in the first half of the 18th century. 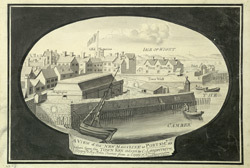 Daniel Defoe wrote around 1720 that Portsmouth had "the best security for any navy above all the places in Britain; the entrance into the harrbour is safe, but very narrow, guarded on both sides by a terrible platform of cannon". The entrance he refers to is The Point, pictured here. This view of the New Magazine is taken from the town key. Landmarks such as the Isle of Wight, 'Old Magazine', 'Point barracks', and the town wall are also pictured.